Home » The Pleasures of Life Dept. Five will get you 10 that you remember that little composition by Steve Nelson and Jack Rollins, the same guys who gave us “Frosty the Snowman.” It was popularized by cowboy crooner Gene Autry, who hippity hopped all the way into the ownership of Major League Baseball’s California Angels. Many symbols attach to Easter — the holy holiday observed by Christians the world over on a spring Sunday between March 21 and April 25 — and “Peter Cottontail” mentions plenty of them, including but not limited to, jelly beans, rabbits and eggs. Sixteen billion (not a typo) jelly beans are made in this country for Easter. President Reagan ate ’em all year long. He got hooked on the things when he gave up smoking. He had jelly bean canisters on his desk and on Air Force One. He even sent jelly beans on the first successful Challenger space shuttle flight, to treat the crew. Raise your hand if you’d rather wash a cat than eat those things. How did rabbits and eggs get into what is otherwise a deeply religious picture? Many historians think the Easter bunny might have more to do with paganism than Christianity. It may have been adopted from the pagan celebration of the festival of Eostre, goddess of fertility, who was symbolized by a bunny. Rabbits, notoriously fecund, are all about bringing new life. Legend, mainly from ancient Germany, is that the Easter bunny lays and hides colored eggs, which are, as much as rabbits, redolent of new life. From there, it’s a short hop (please forgive that) to chocolate bunnies (of which the National Confectioners Association says 90 million pounds were sold in 2017); to Easter egg rolls (like those at the White House, started in 1878 by POTUS Rutherford B. Hayes and conducted almost continuously since); and to Easter egg hunts (like the largest ever in 2007 in Florida, where 501,000 eggs were searched for by 9,753 kids). But forget jelly beans, chocolate bunnies and your everyday Easter eggs. Instead, let’s delve into an egg hunt that’s anything but everyday — a multi-million-dollar hunt for six (perhaps seven) Russian imperial Fabergé Easter eggs. The Las Vegas of Easter egg hunts. This hunt can be said to have started the very moment the Russian royal family, the Romanovs, ended. It was July 17, 1918, when the Russian Bolshevik revolutionaries executed the entire family — all those rumors of Anastasia’s survival now discredited. Comrade Lenin had the family’s Fabergé eggs transported to Moscow. When Comrade Stalin appeared on the scene, he saw dollar signs, not eggs, and began selling the things to the West, particularly in America, probably through Lenin’s old acquaintance, Armand Hammer. Fifty eggs had been presented to the royals. The whereabouts of 43 (and possibly 44) of the eggs are known. So the hunt is all about the ones that have gone missing. The world’s largest collection of Peter Carl Fabergé’s jewelry artworks — including nine of the 50 imperial Fabergé Easter eggs — is in the Fabergé Museum, in the Shuvalov Palace in Saint Petersburg, Russia. The museum, privately owned by Russian Viktor Vekselberg, was established to restore to Russia as many of its lost cultural artifacts as possible. Vekselberg, a Ukrainian-born, Russian-reared billionaire, bought the palace in 2004, restored it, furnished it with thousands of items, and opened it to the public in 2013. He purchased the museum’s nine imperial Fabergé eggs from heirs of American financial magazine magnate and news publisher Malcolm Forbes for something just north of $100 million. Vekselberg’s Fabergé museum, the Shuvalov Palace, presents a brief but interesting side trip. The palace was built in the late 1700s, then in 1799 was purchased from its original owners by Maria Naryshkin. Maria lived there with her husband, Dmitry Naryshkin. She was a princess of Polish nobility, described in her day as impossibly beautiful. Maria and Dmitry unabashedly flaunted her status as mistress of Alexander I, who was, simultaneously, czar of Russia and king of Poland. Some say her affair with the czar lasted 13 years, some say 15, but none say why it abruptly ended. Nobody seems to know. At any rate, Maria’s husband countenanced the affair, beginning-to-end. Whether the czar’s wife, Elizabeth, also agreed to the liaison is academic, as she, herself, is reported to have engaged in affairs with both women and men. All of these goings-on may appear a bit unseemly, but the truth is, Czar Alexander’s court was a hotbed of adulterous affairs, so no one ever raised an eyebrow. But, back to the hunt — the whereabouts of both extant and lost multi-million-dollar Fabergé imperial Easter eggs. Of the missing eggs, with no dispute, one was found in a scrap metal-type flea market in America, narrowly escaping a meltdown to retrieve its gold. That egg was sold and is now in a private collection, though there is no public record of its owner or where the egg is located. With considerable dispute, another of the missing eggs was found in 2015 and is located in a private collection in New York. Russians have long been big on Easter, and exchanging gifts at that time of year is a long-standing tradition. So, a couple of Alexanders down the road we find Peter Carl Fabergé, the most renowned jewelry artist of his time (and perhaps of all time) crafting the first of the imperial Easter eggs for Czar Alexander III. The czar desired a unique gift for his wife, Empress Feodorovna, for Easter, 1885. 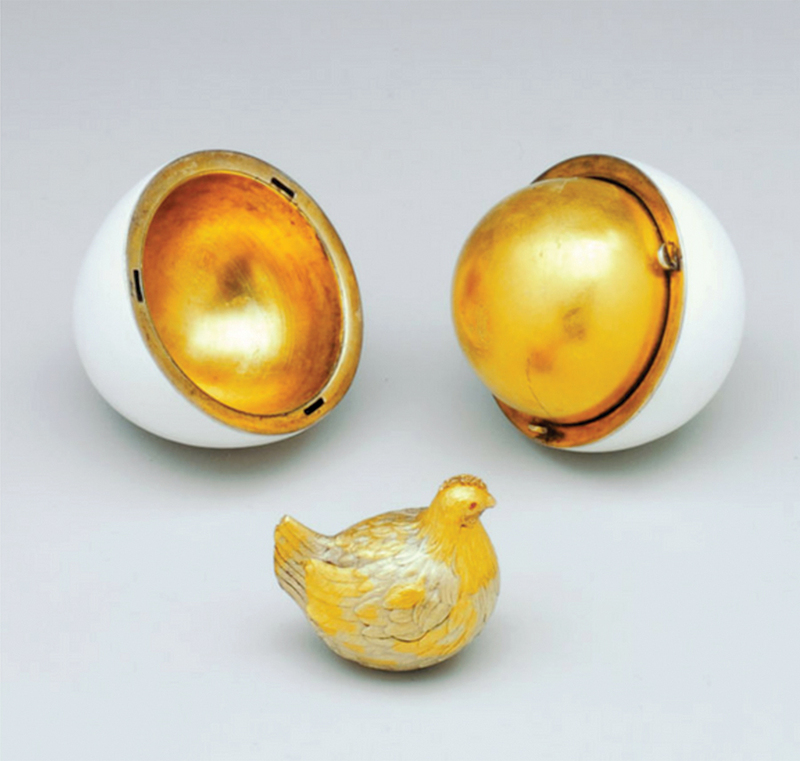 Fabergé’s creation was called “The Hen.” It was presented as a 2.5-inch high solid-white enamel egg shell, with a gold yolk inside the shell and a gold hen with ruby eyes inside the yolk, with a miniature gold and diamond royal crown plus a ruby pendant inside the hen. The czar’s own creation was the beginning of the tradition of turning Fabergé loose on a new egg for the empress each Easter. It was a tradition that lasted through 10 eggs during Alexander III’s reign and through 40 more during the reign of his son, Nicholas II. Nicholas ordered two eggs annually, one for his wife and one for his mother. The eggs were increasingly ornate, opulent, intricate, and increasingly shrouded in secrecy. Most contained a surprise like The Hen’s treasures, which was known only to Fabergé. Not even the czar himself knew of an imperial egg’s surprise till Easter. Following the Russian revolution, The Hen, together with the other eggs, was sent to Moscow. There, The Hen was sold and sold again, and though its surprise was lost (or is privately hoarded), the egg is now in the Fabergé Museum in the Shuvalov Palace in Saint Petersburg. Not surprisingly, many of the surprises were lost or sold separately, as were many of the eggs. The times were a-changing, tumultuous and chaotic during the Russian Revolution and later during the Stalin years. As to the hungry revolutionaries, sadly, their tastes were pedestrian. So really, the surprise is that any of the imperial eggs and/or their surprises survived at all. But they did. Here is where the 44 or 43 (depending on who’s counting) extant eggs are: Fabergé Museum, Shuvalov Palace — nine with one surprise; Kremlin Armoury, Moscow — 10; private collections in the U.S. with known owners — 15; private collection in the U.S. with anonymous owner(s) — 1; Royal Collection, London — 3; Monte Carlo, Monaco — 1; Switzerland — 2; Qatar — 1; anonymous collection where the country is also unknown — 2 (where one of these two, presented in 1902, has since 2015 been in a private collection in New York). Some experts dispute this egg’s provenance and regard it as still lost. Now we come to the hunt for the seven (or six) still missing Russian imperial Easter eggs. Until 2014 Fabergé aficionados feared that eight of the eggs were lost. While it’s never too late to hunt for a Fabergé Easter egg, it actually is too late to hunt for egg No. 3. Some dude in America found it, his discovery underlining the utility of hunting for them. No one knows how the egg arrived in America, but in 2011, Fabergé researchers dug up a 1964 catalog that showed the third egg and noted that it had been sold to a lady from the southern United States for $2,450. When the lady died her estate sold the egg for peanuts and it languished in roadside market venues till an anonymous American Midwest scrap metal dealer purchased it for $14,000. The buyer’s thinking was that he could melt the thing down for its gold, then sell the gold for a small profit. Thankfully, nobody wanted to give him more for the gold than he had paid for the egg. Resigned to his “bad deal,” he sat the egg on a shelf in his kitchen. And there it sat till 2013 when, out of frustration, he Googled “egg” and the name inscribed on a timepiece inside the egg. This bit of bird-dogging led him to an article in a British publication titled: “Is this £20 million nest-egg on your mantelpiece?” There it was! Our guy hotfooted to London, pictures of his egg in hand, to show the expert, Kieran McCarthy, mentioned in the article he found on Google. McCarthy described the guy like this: “He’s from another world entirely. It’s a world of diners and pickup trucks, real blue-collar America.” Blue-collar no more. There is no public record of the amount Wartski paid the Midwesterner on behalf of an anonymous buyer, but it easily could have been the $33 million mentioned in the 2011 article. If you’re a bird dog, you need not be dissuaded by discovery of the “Third Imperial” egg; rather, take heart, as the following six and/or seven are still missing: second egg (1886 — “Egg with Hen in Basket”); fourth egg (1888 — “Cherub with Chariot”); fifth egg (1889 — “Necessaire Egg”); 16th egg (1897 — “Mauve Egg”); 26th egg (1902 — “Empire Nephrite Egg,” potentially already in a private collection in New York); 28th egg (1903 — “Royal Danish Egg”); and 36th egg (1909 — “Alexander Commemorative”). Michael Smith lives in Talamore, Southern Pines, with his wife, Judee. They moved here in 2017 and wish they had moved here years earlier.